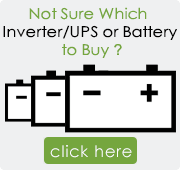 Just select your car make, model and your location and we’ll show you a list of batteries compatible with your car. No matter which car you own, we offer car batteries for all the leading car manufacturers like Audi, Honda, Hyundai, Nissan, BMW, Maruti Suzuki, Tata, Skoda, Volkswagen, Ford, Toyota, and many more. Great savings and complete peace of mind come absolutely free (along with free delivery and installation) with all orders at BatteryBhai.com. We have a 99% record of installing the batteries in 24 hours of receiving the order.